One of the many reasons for starting the new website was to get everything in one place, to have a central location for various items and projects, something that might mean some very historic pieces find their way onto here. Coming up is a case in point. With twitter all a flurry with talk of the two major crime fiction festivals, CrimeFest and Harrogate, it’s always worth remembering and checking out listings for other smaller events in many UK towns throughout the year. 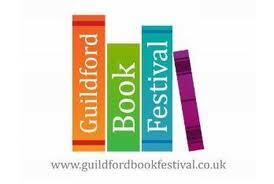 A case in point is The Guildford Book Festival in October – it often has crime fiction author events and, back in 2008, devoted an entire day of the festival to all things criminal. Unable to make this year’s Harrogate Crime Writing Festival, I was so pleased to have two other excellent, although smaller, crime fiction writing events to attend this year (2008) at Reading (which was a superb 3 day event full of all the big names) and more recently the small but perfectly formed Crime Day at Guildford. 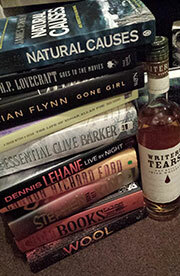 Genre fans were treated to a great mix of crime authors throughout the entire day and benefited from all six main events running with half hour gaps, enabling the fans to attend all on a special priced ticket. Add to that, an excellent two hour workshop with Martyn Waites to kick the day off and it felt like a whole weekend’s festival neatly crammed into one great Wednesday. After two great hours with the amiable Mr Waites in the Theatre’s Farley room with a crowd of other wannabe crime-writers, I rushed downstairs into the main hall to hear Ruth (RS) Downie’s illuminating talk on her roman history crime novels. Half hour later and I listened to Simon Brett quiz M.C.Beaton, Peter Lovesey and Catriona McPherson on the ‘Golden Age of Crime’ – with Lovesey managing to get his excellent post-mortem scene poem into the proceedings once again after Reading a few months back! Then Martyn Waites returned to chair ‘They Can Kill You Anywhere’ and quizzed Barbara Nadel on her two series of novels along with Richard Kunzmann on his South African based books. A lunch break to recharge the batteries and it was straight back in to see Natasha Cooper step in as chair for (the stuck in traffic) Peter Guttridge to interview Victoria Blake and James Morton about their true crime books in the new Crime Archive series. Back to fictional crime again then with Barbara Nadel questioning Simon Kernick, Chris Simms and Graham Hurley on ‘Crime with an Edge’ which was a great last event to the serious stuff of crime writing before the final event of the evening left everyone once again with no doubt that crime writers are a lovely good-humoured bunch, despite the things they write. ‘Foul Play’ – Simon Brett’s Radio 4 show was performed live with Martyn Waites and Stella Duffy superbly creating a cast of thousands between them whilst Natasha Cooper and Michael Ridpath raced to keep up with the twisting plot – both managing to correctly identify the murderer before it was time for us all to head home. A great day out for any crime fiction fan or unpublished writer, full of entertainment, very informative and a great way to introduce yourself to a whole bookcase of new novels you’ll feel compelled to buy afterwards. I’ll be checking on the Guildford website and signing up for their updates, in the hope that they have plenty of similar criminal activity this year.